This hard scrabble life that we call farming is of unequalled value in our society. If you've eaten a meal today, you can thank a farmer. Farmers the world over work hard each day to grow food that is brought to kitchens and plates near and far. Some farmers believe the industrial hype of using chemicals and high technology to grow more, bigger, faster. That's not our farm. Our farm sees progress where others may not. In five years of tending our dear soil, we are just realizing its potential and see its future as it continues to grow and thrive. We think about our impacts, every decision we make has a consequence to something or someone. Making this work a delicate balancing act. We strive to create connection with food and community. We work to create a living for ourselves. Making money at farming should be a given, not an exception. I am not talking about making an exorbitant amount of money that will pay for a second home, lavish vacations and the like. But to be able to buy a modest piece of land to work, make our monthly student loan payments, and allow us to travel by car to destinations where we can walk freely with our basic needs on our backs (I'm looking at you Bob Marshall Wilderness). We began to dabble in adding value to our homegrown vegetables in the 2013 season. Seeing a desire for these products at farmers markets, especially around the holidays. We started with a fresh pesto that took off with resounding success. Adding to that, we began to scale up recipes that we had been using for our own home canned items that we eat almost daily. Our slow-roasted salsa has been in the development stage for nearly four years. We love its deep, smoky flavor and that you can dip a chip and come up with a full scoop each time. Anyway, as farmers and entrepreneurs we are always looking for ways to add value to what we do. We analyze each square foots of space we grow food on and ask "how can we make this more profitable?" Well, cooking, spicing, canning it up makes food more valuable. We still hold our core values at heart, no synthetic chemicals, creating biodiversity, that we grow as much as we can on our farm for our preserved foods, and if we need more product to preserve, we support other local farmers who share our passion for chemical free farming. We also use our purchasing power to support other local businesses to order things we need (like jars, sea salt, sugar, etc). A special thanks goes here to Spence Hardware that has been helpful and supportive for many years. When I ordered a pallet of canning jars a couple of weeks ago, the enthusiasm for what I was doing was electric. Thanks Spence Hardware in Moscow, ID!! We hope that by adding value to the things we grow and consume, we can make our little urban farm a little more financially resilient in these times of uncertainty. That we can enjoy a life that includes more time with our families and friends, time to travel and explore, resources to purchase a small farm in Moscow and continue the life that we love. Here come the kids! Fist set born February 26th, 2014. Wildflower delivered three beautiful bucklings (boys) in the morning. Within an hour all three were up and feeding regularly. Some beautiful kids in this batch. They will be for sale and ready for new homes in the end of April. If interested in buying from us: We do not disbud any kids, we know the health benefits of horned goats and its essential role in heat regulation. All kids are bottle raised by us after 3 days of age. CAE & CL tested negative. All health records are available for viewing for dam and sire, but are not included in purchased kid health record packet. Naturally raised without the use of chemical wormers or supplements unless absolutely necessary and will be fully disclosed in health records. 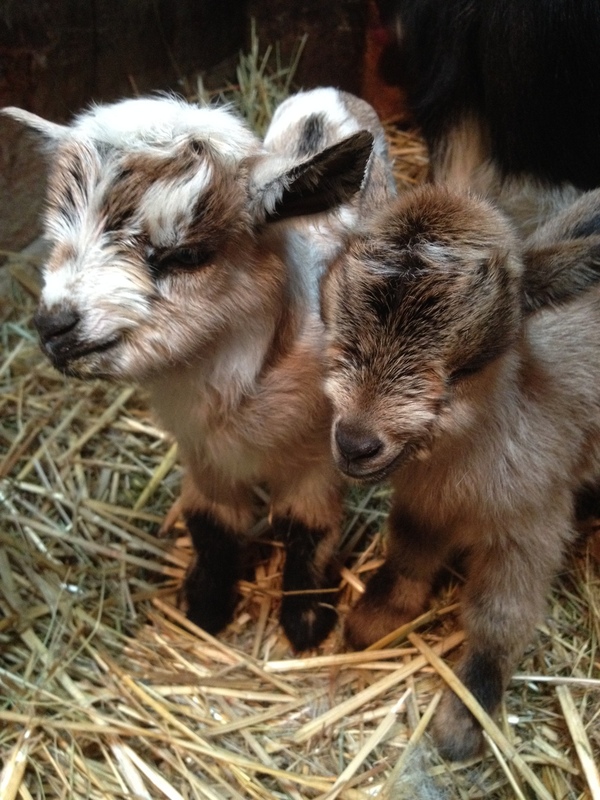 We raise Nigerian Dwarf goats for dairy production and cheesemaking.